It is a given of Theresa Rebeck’s new, thought-provoking, though overstuffed new play, Bernhardt/Hamlet, that 19th-century stage diva Sarah Bernhardt was one of the greatest actresses who ever lived. To cement that point, she is played in the Roundabout Theatre’s premiere production by the stunning Janet McTeer (A Doll’s House on Broadway, Tumbleweeds on the silver screen), who can convince us of just about anything. But the year is 1897, Bernhardt is on the far side of 50, which makes another turn as Ophelia somewhat dubious. While she is most right now to play Queen Gertrude instead, such casting is unthinkable for the still alluring theatrical legend. So she announces to an incredulous world that she will essay the only role worthy of her talent – Prince Hamlet himself. That, by the way, is exactly what Bernhardt did, but Rebeck has more lofty goals than mere historical recreation, preferring to use the actress’s quest for validation as an exploration of gender politics, onstage and off. For even her admirers find her aspiration preposterous. Sure, they concede, men played all the female roles in Shakespeare’s day, but how on earth would audiences accept a woman taking on a man’s role, let alone the greatest, most bottomless, complex male role ever written? At least in the first act, when Rebeck focuses on Bernhardt’s efforts to find her Melancholy Dane, the play illuminates the rehearsal process, the depths of Shakespeare’s skill and the many ways that Hamlet can be played, all stated with robust humor. And while that would be more than enough for an evening of theater, Bernhardt/ Hamlet takes a hard left turn at the first act curtain, when the actress implores playwright Edmond Rostand – who also happens to be her lover of the moment – to rewrite Hamlet for her. To remove the poetry, no less. Rostand (a dashing Jason Butler Harner) has his own play in development, something about a swashbuckling romantic with an oversized proboscis. And in a disappointing example of bait-and-switch, his Cyrano de Bergerac threatens to take over the second act, including a lovely, but tangential cutting from the play which feels like padding and keeps McTeer off the stage for too long. If nothing else, it does allow the estimable Dylan Baker as the leading man in Bernhardt’s troupe the juicy opportunity to perform some of Cyrano’s rapier wit. Also an asset to the production is Matthew Saldivar as Alphonse Mucha, the poster artist tasked with designing the advertising artwork for Bernhardt’s Hamlet. 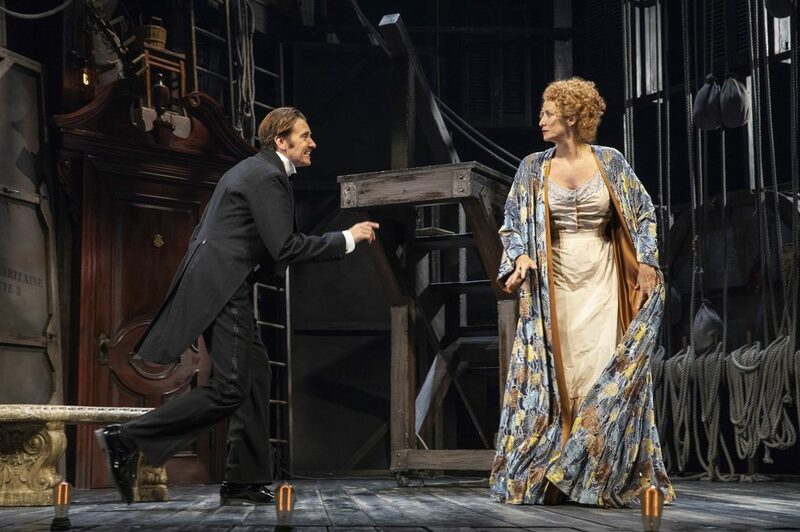 And popping up briefly in the second act is Ito Aghayere as Rostand’s wife Rosamond, bulling her way into Bernhardt’s dressing room, but not, as we expect, to protest the actress’s canoodling with her husband. With all these intriguing threads, Rebeck might as well have written a miniseries. As it is, Bernhardt/ Hamlet either needs to be longer or shorter, with some of the supporting characters’ threads snipped away. Although I will deny ever suggesting this, perhaps Rebeck could turn her play into a one-woman show, for the reason to see Bernhardt/ Hamlet really is to watch McTeer give what will surely be one of this nascent season’s standout performances. She gives a master class in mercurial mood swings, from tragic to comic and all shades in between. And when she gets to chew on some of Hamlet’s best passages – like his exchanges with the ghost of his father or his school chums, Rosencrantz and Guildenstern – you will want to see her perform the entire play. We might as well give director amortization Von Stuelpnagel partial credit for McTeer’s triumph, though he might have steered Rebeck toward more editing. Beowulf Boritt sends the play’s world spinning with a terrific revolving scenic design and Toni-Leslie James provides a rack full of gorgeous period costumes. Bernhardt/Hamlet is hardly a perfect play, but it still impresses as the Roundabout’s first-ever commissioned original work on Broadway. And it plays even better than it must read on paper because of the amazing McTeer. BERNHARDT/HAMLET, American Airlines Theater, 227 W. 42nd St., New York. Through Nov. 11. 212-719-1300.